Joey Barton admits he feels “privileged” to be back with Burnley. 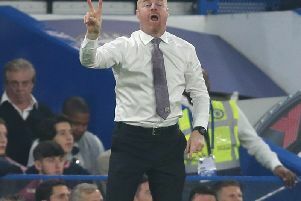 And after his match-winning goal against Southampton on Saturday, he intends to continue to repay manager Sean Dyche, the players’ and fans’ faith in him. After helping win the Championship title, Barton turned down a new contract at Turf Moor for a fresh challenge with Rangers. However, he endured an ill-fated time at Ibrox, and had his contract terminated in November, after a reported training ground confrontation in the aftermath of the 5-1 defeat at Celtic in September. After accepting an offer to train back at the Barnfield Training Centre at Gawthorpe, he has sharpened up his fitness and signed a deal to the end of the season once the transfer window opened. Barton is “humbled” by the club’s loyalty, and he said after his free kick saw off the Saints: “The gaffer has shown an incredible amount of faith in me in amongst the circus that kind of goes on in and around me. “This club has shown commitment to me by bringing me back. I didn’t have a great time up the road, and to show that faith in me the minute they knew it wasn’t going to plan and I was going to be out of a club, they were on the phone offering me the chance to train at the club. “The fans, the reception....people forget I left this club so they would have been within their rights to boo me. That reception makes me incredibly humble and I was just so proud to come on and receive that. “Sometimes at football clubs, it just fits. From the minute I’ve walked into this football club, it just works. “They understand me and I understand them, it just works and that isn’t always the case. I’m intent on giving all I can for this case and when I score it goes some way to validate the gaffer’s faith in me - and the players because they didn’t have to accept me back the way they have. Barton doesn’t deal with regrets, and is just looking at the here and now: “I don’t really do regrets. If you go through the rollercoaster of my life, I don’t really focus on the past. It’s probably my greatest strength and my greatest weakness at the same time. “I just keep pushing forward. If I focussed on the past too much, I wouldn’t do what I’ve done in my career because there’s so much nonsense that goes on around me. You just have to keep believing in what you are about. And Barton accepted: “Sometimes things just work out funny. Football is a funny old game.